Kansas Poker – Is Online Poker Legal in Kansas? Kansas is like most states (for poker players). Some things are okay. Other things… eh… not so much. The key is to know which is which. Not knowing some of the fine print of the current laws in place can have you facing misdemeanor charges, prison showers and other hefty fines. But if understand your legal poker options in Kansas then you can avoid all the aformentioned bad stuff and just focus on having fun playing poker. 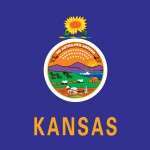 Kansas is yet another state without laws about social gaming. Section 21-4303 Making a bet; or entering or remaining in a gambling place with intent to make a bet, to participate in a lottery, or to play a gambling device. Most states say that social gaming is ambiguous. Except that when most states say nothing, a good rule of thumb is to resort to their more general laws. In this case poker is considered gambling/betting. Therefore it’s illegal and a class B misdemeanor. But, like I say on all our state pages – chances are you can get away with a home game if you keep it quiet and don’t make a public spectacle out of it. You hardly ever hear of these smaller games being broken up by the police unless word gets around about how big the game is or if a ton of money might be involved. Just know that it’s not on the up-and-up, but depending on your moral compass it really shouldn’t matter all that much. And don’t expect things to get any better, either. Back in 2013 online poker was addressed in House Bill 2055. The premise behind the bill was to expand brick and mortar gaming in the state. And it had a clause. The clause was online gambling had to be banned. If someone broke the law they would be charged with a misdemeanor and would face 6 months in prison and a $100,000 fine. All in the name of protecting the brick and mortar casinos in the state. Naturally, right? The bill was voted down 24 to 15 – not a landslide. Analysts believe we may see a similar bill and/or clause in the future. Kansas Attorney General Derek Schmidt was one of fifteen that requested an expansion of the 1961 Wire Act to include banning all forms of online gambling. This request was apart of the campaign run by Las Vegas Sands owner Sheldon Adelson and his cause, the Coalition to Stop Internet Gambling. So… not only should you assume online poker is illegal here. You should also assume it will be illegal for years to come. Live poker is an option in Kansas. But only in licensed and regulated casinos. There are plenty more. Just Google them. As far as games, you’ll have plenty of choices. You can play Texas Holdem, Omaha, Stud and more. You can also find bad beat jackpots, cash games and guaranteed tournaments running daily. Outside of poker you can of course play other games like slots, blackjack, craps, baccarat, roulette, video poker or progressives. You have no shortage of gaming options. And better yet – there’s so many casinos in this (small) state that no one should have to travel far to get to one. Experts think that 2018-2019 is when we’ll see a change in legislation. Although being that this state is in the Bible Belt area (aka the Midwest) it could be a bit longer before state representatives break their stance on online gambling. There have already been several attempts to block or ban online gambling. And I didn’t come across any attempts to regulate it – so that makes the prospects of legal iGaming look somewhat dim. And when you consider that the state takes in $13 million each year from their casinos, you have to wonder if they can even see the forest for the trees. Do they see that they can make more money by legalizing online gambling to some capacity? So you have all that. Then you consider how small a state they are, which would make striking instrastate poker deals difficult – difficult, not impossible. All in all, it’s hard not to be pessimistic about online poker being legalized in Kansas in the near future.